Planned Parenthood, the world’s leading provider of abortions, has been caught in three embarrassing hidden camera sting videos, which show doctors secretly negotiating the sale of babies’ body parts. To add further disgust to the scenario, two of the meetings take place in nice restaurants, where doctors are causally sipping fine wine and eating salads while discussing their illegal practices. In the videos the doctors discus how they go the extra mile to “crush” the babies’ heads, ensuring that the vital organs and extremities are good enough to sell. One doctor admits to changing the method of abortion without the mothers’ consent in order to get the best parts to sell; she acknowledges the illegality of her technique, but said she isn’t worried about it. The most stunning line in the videos shows a doctor laughing about her illegal negotiations, quipping that she needs a Lamborghini. When asked to throw out a number she wants for the dismembered body parts, she reminds the buyer that whoever throws out the first number in negotiations always gets a bad deal. Planned Parenthood has issued a statement saying no laws were broken, which is a lie both Bill Clinton and Richard Nixon would appreciate. They claim that selling the remains is routine, but if so, why the negotiations? There would certainly be a fixed cost per part, and not left up to negotiators. I have also been dumbfounded by the selective outrage here. Why are we only concerned that Planned Parenthood is selling dead baby organs? Why are we not bothered that they first butcher the baby in order to obtain said organs? Bill O’Reilly said on his show that America is on the brink of becoming barbaric. With all due respect, Mr. O’Reilly, the crushing, decapitating, and dismembering of babies has gone on legally in this country for forty-two years; if that isn’t barbaric, then neither is selling them. If doctors are negotiating their own sales to the point of driving Lamborghinis, then at what point do we cut off taxpayer funding? Did you know that a half billion of your tax dollars goes to Planned Parenthood every year? Before everyone forgets this story and moves on to Donald Trump’s next press conference, let’s demand the defunding of Planned Parenthood. Now is the time. The country can see how disturbing this is, and how little they need our money. Some will call this a war on women. If we defund Planned Parenthood, how will we get birth control? How will we get cancer screenings? You are sending women back to the Dark Ages! As if the only thing in the world women care about is birth control, and the only place anyone can find it is Planned Parenthood. Did you know that Planned Parenthood has never performed a cancer screening? Despite using that as their shield to stay in business, they only give referrals to have screenings done at actual medical establishments. Life could certainly go on without Planned Parenthood, especially for the millions of babies they abort. Its time to defund them. I thought it was just a glob of tissue. To say the baby has a future is to admit that all babies in the womb have a future. Those proud pro-choice activists are proudly robbing children of their future. What if that baby you aborted was a future president, Nobel prize winner, or the one to cure cancer? We don't know. That's what happens when you destroy an innocent person's future before we have the chance to find out. 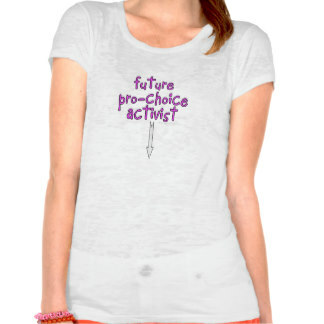 The shirt says, "I'm grateful my friend's abortion was safe and legal. Safe for who? Depending on the method of legal abortion, the baby was either dismembered, decapitated, or poisoned, violently stopping a beating heart. The shirt should say, "I'm glad my friend legally murdered her baby."